Sofia Vasilyevna Kovalevskaya (Russian: Со́фья Васи́льевна Ковале́вская), born Sofia Vasilyevna Korvin-Krukovskaya (15 January [O.S. 3 January] 1850 – 10 February 1891), was a Russian mathematician who made noteworthy contributions to analysis, partial differential equations and mechanics. 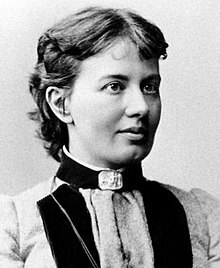 She was a pioneer for women in mathematics around the world – the first woman to obtain a doctorate (in the modern sense) in mathematics, the first woman appointed to a full professorship in Northern Europe and one of the first women to work for a scientific journal as an editor.